Baking your own homemade dog cookies is fun, saves money and is healthier than most commercially made dog treats. This month I hope to make it even easier for you to make the very best dog treats for your dog with a few helpful tips. 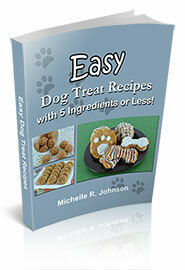 Gluten Free and Grain Free - It is so simple to make all of your homemade dog treats gluten and/or grain free. Take any of my dog treat recipes and substitute with a gluten free flour mix. Or, if you want your treats to be both gluten and grain free, you can make your own mix at home. For each cup of whole wheat flour that you want to substitute, replace it with a blend of 1/2 cup garbanzo bean flour, 1/4 cup almond flour and 1/4 cup of tapioca flour. Measuring Flour - If you are making my dog treat recipes and find that sometimes your dough isn't coming together well, you might be using too much or too little flour. With all of my recipes I use the scoop and sweep method of measuring flour. Take your measuring cup, grab a regular spoon and slowly sift the flour into the measuring cup. Once the flour has made a slight mound over the top of the measuring cup, use the back of a butter knife and scrap off the top to make it even. I prefer a set of straight edged stainless steel measuring cups for all of my baking needs. Replace Eggs - Some of our dogs can't tolerate eggs, so do you have to skip all the treat recipes with eggs? Absolutely not! :) Stir together 3 tablespoons of ground flax seed with 1 tablespoon of hot water. Set aside for about 5 minutes. Then when the recipe calls for the eggs, add the flax seed mixture instead. I hope these few tips will help you to continue making homemade dog treats for your special four legged kitchen helper. :) If you have any questions about how to make homemade dog treats, feel free to reply to this newsletter or use my Contact Us form on the website. Spring is in the air and carrots are on my mind. It must be because every store I go into has rabbits everywhere, I just keep thinking about carrots and carrot dog cookies. :) Enjoy these few recipes and let your dog chomp on some sweet and healthy treats. 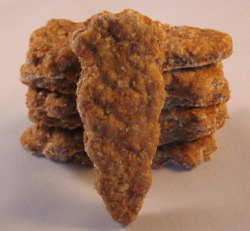 Low Fat Carrot Dog Treats - These treats have the sweetness of carrots, bananas and applesauce with very little fat, but a whole lot of taste. 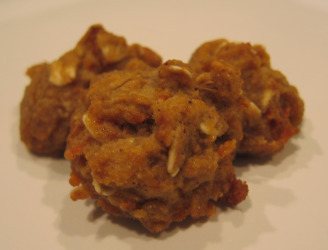 Apple Carrot Nibbles - This recipe uses rice flour, so it would be perfect for a gluten free dog treat. The addition of molasses makes these little nibbles even more sweet and delectable. 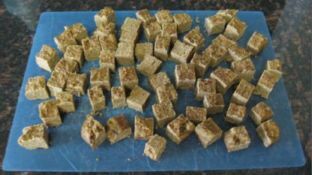 Carrot & Liver Brownies - If you're looking for a high reward, yet still healthy dog training treat, look no further. These liver and carrot brownies are sure to please even the pickiest of pooches. 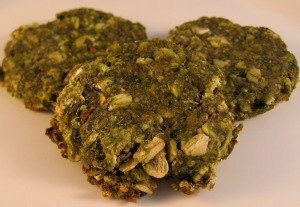 Spinach & Carrot Dog Cookies - This dog treat recipe usually focuses on the spinach, yet it has 1 full cup of grated carrots, too. :) Don't worry if you think your dog won't like the spinach. This homemade dog cookie has a little Parmesan cheese, chicken broth and extra virgin olive oil to entice a bite or two of these heart healthy treats. The third week in April is National Pet ID Week. No one wants to think of their dog being lost. Unfortunatley it can happen very quickly. It only takes a moment of a door being left open, a gap in the fence or another enticement and your dog could find himself alone and lost. Dog Tags - Tags have come a long way since a plain metal circle with your address and phone number. Now you can outfit your dog with a Web & GPS enabled QR code tag. Each tag allows you to set up a private, web page for your pet. At any time, update information like your address, facebook page, pet's medical information and more. Once your dog is found, a person can scan the QR code and their location is then sent to you to view. Customized Collars - Your next line of defense can be an embroidered dog collar. Have your dogs name and your telephone number permanently sewn into their collar. You can also have the lettering be reflective to show up in the dark. Microchip - This is a rice sized capsule that is implanted just under your pets skin. When it is registered with your information the agency that finds your dog can scan them implant and contact you immediately. Tattoo Identification - This is a permanent application of an identification code that is put in the dog's ear, abdomen or on the inside of the thigh. Ask your Veterinarian for more information on this form of ID. 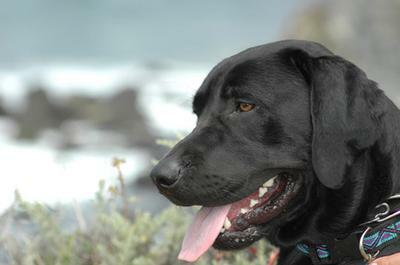 Our Featured Fan for the month of April is Gardel an English Black Lab. His guardian Lourdes, has this to say: His favorite treat is a homemade apple honey cookies with whole wheat and corn meal. He has 2 meals every day (lunch and diner) based on chicken, rice and vegetables (corn, green beans, carrots, sweet potatoes and broccoli). Once a week scrambled eggs, liver and Greek yogurt. He also loves pears, manzanas and watermelon. Every day we share long walks, such us the Green Belt, the park or mountains. Summer time is beach time, swimming and running through the South Bay coast. Favorite toy: Folgers coffee cans, if 2, better! "Enjoyed her recipes. Very simple to make and easy ingredients you have on hand. My dogs give it 5 stars!" "Just want to say I LOVE your site, all your help. You are an amazing dog lover and my little JRT loves everything I make. Then I started making treats for the 2 rescued dogs my daughter has now and they love when I visit 'cause I'm never empty handed. Then others asked and now I am supplying a number of rescued, elderly, and other pets that just need to start eating more healthy."